Powered industrial trucks, also known as forklifts, fall under Part 1910, Subpart N, titled Powered Industrial Trucks under the OSHA standard. 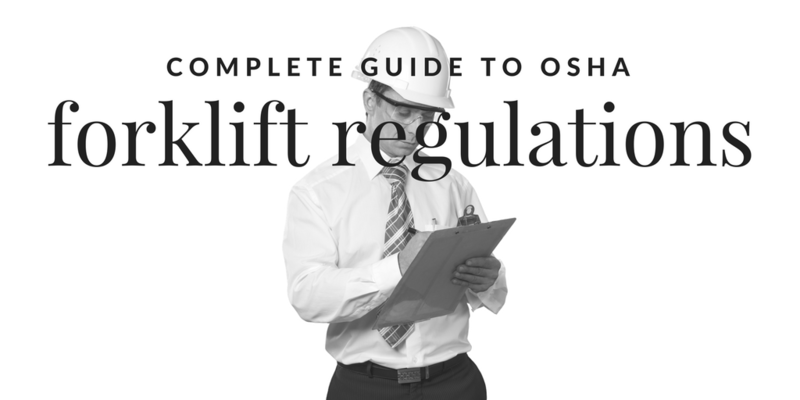 You can find this information on OSHA’s website under Occupational Safety and Health Standards and Materials Handling and Storage. The general requirements involve the safety requirements for fire protection, design, maintenance and operation of fork trucks, tractors, platform lift trucks, motorized hand trucks, and other specialized industrial trucks that are either electric or powered by internal combustion engines. It does not cover compressed air, nonflammable compressed gas industrial trucks, farm vehicles, or vehicles used for earth moving or over-the-road hauling. All new and used powered industrial trucks must meet the design and construction requirements established in the “American National Standard for Powered Industrial Trucks, Part II, ANSI B56.1-1969”. All approved trucks must have a label or other mark indicating the approval of the testing laboratory. Modifications and additions that change the capacity and safety of the industrial truck cannot be performed by customers or other users without written approval from the manufacturer. Approved truck or approved industrial truck refers to a truck that has been approved for fire safety by a nationally recognized testing laboratory using nationally recognized testing standards. There are 11 designations of industrial trucks or tractors that are included in this section, including D, DS, DY, E, ES, EE, EX, G, GS, LP, and LPS. D trucks are similar to G trucks apart from being diesel engine powered and not gasoline engine powered. DS units are diesel powered that come with additional safeguards on the exhaust, fuel, and electrical systems. DY units are diesel powered that have the safeguards of the DS without any electrical equipment including the ignition, and come with temperature limitation features. E trucks are electrically powered that have minimum acceptable safeguards for fire hazards. ES units are electrically powered that have all the same requirements as E units with the addition of safeguards to the electrical system to prevent emissions of sparks and limit surface temperatures. EE units are electrically powered and have the same requirements as E and ES units with the addition of an enclosed electric motor and other electrical equipment. EX units are electrically powered and have electrical fittings and equipment that is designed for usage in areas where there may be flammable vapors or dusts. G units are gasoline powered that have minimum acceptable safeguards to protect against fire hazards. GS trucks are gasoline powered that come with additional safeguards to protect the exhaust, fuel, and electrical systems. LP units are similar to G units but use liquid petroleum gas for fuel instead of gasoline. LPS units use liquefied petroleum gas that come with additional safeguards to protect the exhaust, fuel, and electrical systems. 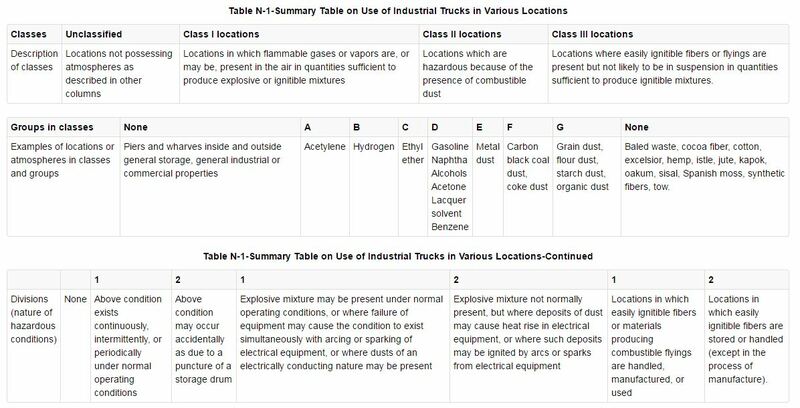 Powered industrial trucks must not be operated in areas containing dangerous concentrations of acetylene, butadiene, ethylene oxide, hydrogen, propylene oxide, acetaldehyde, cyclopropane, diethyl ether, ethylene, isoprene, unsymmetrical dimethyl hydrazine, dust of magnesium, aluminum or aluminum bronze, or in atmospheres containing carbon black, coal, or coke dust. See Table N-1 to review the permitted area of use for each designation, of which may contain one or more of these substances. High lift rider trucks must have an overhead guard designed in compliance with the American National Standard for Powered Industrial Trucks, Part II, ANSI B56.1-1969. If the load presents a hazard, the truck shall be fitted with a vertical load backrest extension. Gasoline and diesel fuel, and liquefied petroleum gas must be stored and handled in compliance with NFPA Flammable and Combustible Liquids Code. Battery charging stations should be placed in areas designed for that specific purpose. Facilities should be given tools for flushing and neutralizing spilled electrolyte, for fire protection, for protection of battery chargers from damage, and adequate ventilation of fumes from gassing batteries. A conveyor or overhead hoist must be used for handling batteries. Reinstalled batteries must be properly positioned and secured in a truck. Trucks must be positioned and braked to change or charge the battery. Battery vent caps must be functioning. Smoking is not allowed in the battery charging area. Auxiliary lighting should be used where general lighting is less than 2 lumens per square foot. Levels of carbon monoxide gas from powered industrial trucks must not exceed levels specified in section 1910.1000. Each powered industrial truck operator must be competent to operate the truck safely following completion of training and evaluation. Trainees can only operate a truck under direct supervision of experienced operators, and where training does not endanger other employees. Training should consist of formal instruction, practical assessment, and evaluation of the trainee’s performance. Training shall consist of truck-related topics and workplace-related topics. Refresher training is required every three years, or sooner, if the operator is involved in an accident or operating in an unsafe manner, the operator is assigned a different type of truck, or the condition of the workplace changes. Each passing trainee shall receive a certificate proving they have been trained and evaluated to operate powered industrial trucks. Powered industrial trucks must not be driven up to a person standing or sitting on a fixed object. Unauthorized personnel cannot ride on powered industrial trucks. No one must stand or pass under the elevated portion of any truck, loaded or empty. All traffic regulations must be observed with a safe distance between trucks. Grades must be ascended or descended slowly. The truck must be operated at a speed that allows a safe stop. Stunt driving is not allowed. Only stable or safely arranged loads with the rated capacity can be handled. If a powered industrial truck is in need of repair or is defective in any way, it must be taken out of service until repairs have been made. Fuel tanks must not be filled while the truck is running. The additional regulation not included in this guide is Maintenance of Industrial Trucks. For the complete listing of all powered industrial truck regulations, go to the 29 CFR standards page on the OSHA website.